Image: Christopher Polk/Getty Images for People's Choice Awards. You may have been preoccupied, living your life and doing your thing earlier this week (and that's totally cool), but we feel it's very necessary for you to stop whatever you're doing and take a look at the beautiful video Ellen DeGeneres shared of her wedding day 10 years ago. It is perfect, and you deserve to treat yourself to this heartwarming exhibition of love. 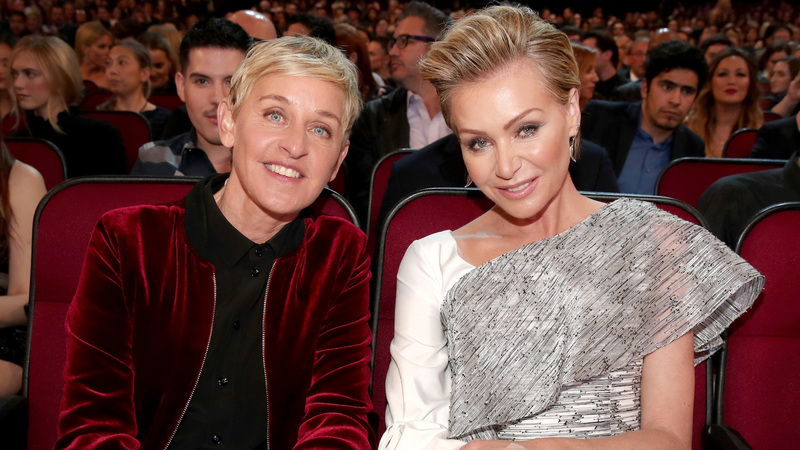 DeGeneres and her wife of 10 years, the gorgeous and talented Portia de Rossi, have always been #CoupleGoals. We've loved watching their relationship mature as time has gone by, as they stood by one another, laughed together, participated in charitable endeavors together and even done adorable things like interview one another on The Ellen Show. But, as DeGeneres reminded the world on Thursday, their journey as spouses and best friends began on Aug. 16, 2008. DeGeneres took to her Twitter account to post a heartfelt video from her wedding to de Rossi, with the caption, "Ten years ago today. This was such a special day for us." The video shows the first moments that she and de Rossi saw one another in their gorgeous wedding outfits, wedding photos and video of them together and hanging out with their dogs. Best of all, the video also shows them sitting together at their reception as they're serenaded by Joshua Radin, who sings "Today" and plays guitar. DeGeneres also hopped onto her Instagram to post a sweet black-and-white photo of her, de Rossi and author and philosopher Wayne Dyer, who officiated their wedding. Overlaid onto the photo was an excerpt from Dyer's speech on their big day, giving us all another sneak peek at the wedding. "Ten years ago, Wayne Dyer officiated our wedding ceremony," DeGeneres captioned the photo. "These words were life-changing to us then, and they mean just as much now." And, to celebrate National Roller Coaster Day (although we think it was a sly excuse to celebrate their anniversary a bit more), DeGeneres posted a video of her and her wife riding a roller coaster together 10 years ago. Too precious, if you ask us. Once again, DeGeneres and de Rossi have reminded us how truly special their bond is and we are so, so happy that they did.